Aligns the selected layers along the x, y or z axis. Here the term 'aligns' must be interpreted as 'puts next to each other'; the first selected layer serves as a reference layer and it does not move. 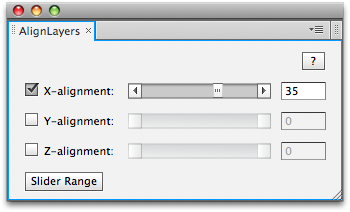 You can align layers having different sizes. A constant offset between two adjacent layers can also be specified.